Based on the popular children’s books, Max and Ruby has become a cutesy show for toddlers and of course for myself as well. 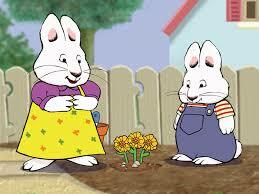 Max and Ruby are bunny siblings living together without parents. Yes, you heard right. This show teaches kids that living on your own when you’re under 10 years of age is possible as long as there are two of you. So technically, it’s not really living on your own, but whatever. I’m assuming Ruby doesn’t pay bills, yet they live in a house with running water and electricity. So idk what’s going on. Although the whole parent thing is a mystery, Max and Ruby are pretty normal otherwise. Ruby is the bossy “grown up” sister who orders Max around. She loves Max and includes him in her play time, but she can’t replace a real mom. I mean, I’m still freaked out about the absence of parents on this show. Maybe their mom and dad bought them that house because they have so much money? Yeah that must be it. Max is a mischievous little bunny boy who likes food and playing games. I don’t remember him saying much of anything in the books, but in the show he’ll say a couple of words here and there. I like Max’s muteness. It makes him cuter. He and Ruby are very chunky and I definitely wouldn’t mind cuddling them or just buying some rabbits and naming them Max and Ruby…I mean what? Ruby has a couple of girl friends that will come over and play with her. Normally her friend Louise will come over and occasionally she’ll bring her cousin Morris who is Max’s friend. Max doesn’t have as many friends as Ruby, but then again he’s not a member of The Bunny Scouts like she is. Wouldn’t that be something that you need a parent signature for? Ugh forget it. I’m pretty sure the brown one is Louise. I don’t know who the little soccer bunny is. There are a handful of other characters but I don’t really care about them. However, through some serious research (or just looking at Wikipedia) I’ve found out that Max and Ruby have a grandma that visits sometimes. At least she’s around. 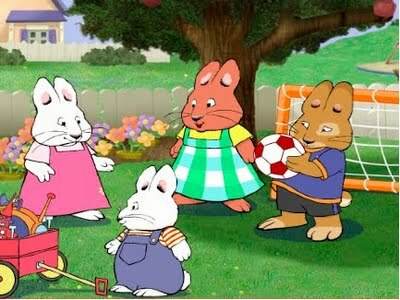 I really worry for Max and Ruby’s well-being if you haven’t noticed. Overall, Max and Ruby isn’t a very exciting show. It’s not super creative, but it’s good because it helps kids understand how important siblings are. It also teaches you that not having any parents can still be pretty fun. And if you’re an only child, you’re pretty much doomed. This entry was posted in Nick Jr. Shows and tagged bunnies, humor, louise, max and ruby, no parents. Bookmark the permalink. I always thought about that when I watched this show with my son…. Where are the parents??? And Grandma would at least come by to visit now and then… But didn’t seem to care enough to take these two abandoned children in. Yeah, like usually grandparents are even more responsible than parents. And I guess she kind of is since she visits on occasion whereas the parents aren’t ever around. But like, couldn’t she just bite the bullet and live with her grandkids? Are they that much of a buzzkill? How long do rabbits live? Maybe the parents are dead and the grandma is some lucky outlier bunny that has somehow lived longer than expected? I think Max and Ruby were trying to capitalize on the popularity of Party of Five where the parents are dead and the older sibling has to take charge. You could be right about the freakish bunny grandma. Their parents must be dead. But like, they must be really good at grieving because they don’t seem to care at all. My daughter used to go NUTS for this cartoon! The live show version comes to Niagara frequently. Yeah it’s a great one! I really like these two bunny siblings. That’s cool that the Live show comes around every so often. I’ve always been intrigued by those shows.